Facts about Kemp's Ridley Sea Turtles. "Scientific name for Kemp's Ridley Sea Turtle is Lepidochelys kempii". Consider one of the smallest and most endangered of the all sea turtles, The Kemp's Ridley Sea Turtle has a carapace that reaches 24 to 28 inches (61 to 71 cm). The Ridley’s carapace is circular in shape. Approximately ninety five percent of the Kemp's Ridley Sea Turtle population nest on a 17 mile beach front at Rancho Nuevo, Mexico. A Mexican engineer filmed an estimated 42,000 Kemp's Ridley Sea Turtles nesting at Rancho Nuevo in on day in 1947. Only 1,429 Kemp's Ridley Sea Turtle nests were discovered in 1995 at the same location. In the New York Bight, from June to October solitary 2 to 5 year old Kemp’s Ridley sea turtles can be found. Especially the Peconic Estuary, Gardiners Bay, Long Island Sound and Block Island Sound. This region is important to the survival of the Ridleys because they Bight in their development cycle. These turtles prefer to feed on spider and green cards. The adult Kemp's Ridley Sea Turtle can weigh between 78 to 100 pounds (35.4 to 45.4 kg). Their diet consist of mainly crabs, but also clams, mussels and snails. The Kemp's Ridley Sea Turtle habitat is mostly limited to the Gulf of Mexico. They prefer the shallow areas with sandy and muddy bottoms. Juveniles travel between tropical and temperate coastal areas of the northwest Atlantic Ocean. 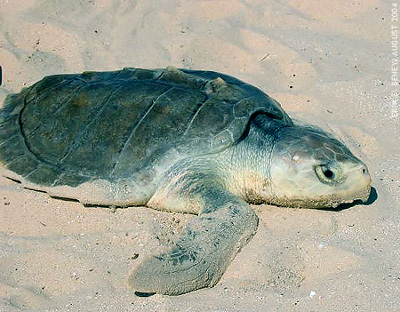 The Kemp's Ridley Sea Turtle are the world’s most rarest sea turtle. They were listed as endangered since 1970 and the population is steadily increasing. The average life span for the Kemp's Ridley Sea Turtle is 50 years.